RDPOA’s embroidered patch is 3 1/2 inches in diameter, blue and gold with a white background. RDPOA’s metal pin is about the size of a quarter and is a mini version of RDPOA’s retirement badge. 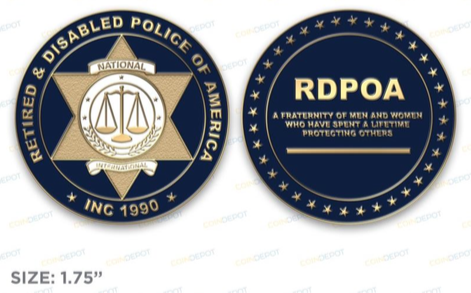 RDPOA’s metal coin is blue and gold and is 1 3/4 inches in diameter. Click HERE to Order PATCHES, PINS & COINS.